Milo Cereal always delivers that great MILO taste... and because it's made with wholegrain and contains fibre, it delivers great nutrition too! Wholegrain Cereals 50% (Wheat 34%, Corn 16%), Sugar, Milo 10% (Malt Extract (Barley and Rice and/or Wheat), Milk Solids, Sugar, Cocoa, Maltodextrin, Emulsifier (Soy Lecithin), Minerals (Calcium, Iron), Vitamins (C, BE3, BE6, BE2, BE12, A, D)), Wheat Flour, Fat-Reduced Cocoa Powder, Barley Malt Extract, Skimmed Milk Powder, Sunflower Oil, Emulsifier (Soy Lecithin), Flavours (Chocolate and Vanillin), Salt. 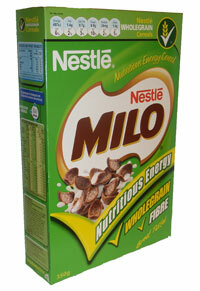 Milo cereal: A super food. I regularly consume milo cereal, and find that it is not only delicious - but also very beneficial for my health as it is high in protein, iron, and b vitamins. Since, consuming MIlo Cereal, on a regular basis, I have found that my hair is more glossier, stronger, and my skin too, is more hydrated! Moreover, I have noticed that it has helped with weight loss, as it keeps me staying fuller for longer. Overall, I am delighted with this product, and would not hesitate to recommend to friends.